With our Family Winter Festival coming up soon we want you to WIN a Family Day Pass! Fill out the form below and you could be skiing and snowboarding with your family for Free! 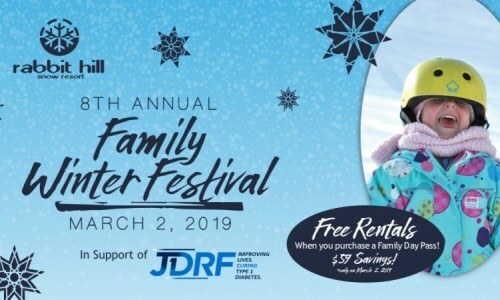 For more information on our Family Winter Festival click here. * Family Day Package includes One Day Area Lift tickets and Ski or Snowboard Rental packages for up to 4 Immediate Family Members. Immediate Family is defined as up to 2 adult parents/guardians and dependant children under 18 years of age living in the same residence. Additional immediate family members are an additional charge. Limit of one entry per person. Prize draw will be made February 22, 2019. Winner will be notified by email and/or phone. Prize must be accepted as awarded. Prize is non-transferable and have no cash value. Odds of winning are dependent on the number of entries received. Employees of Rabbit Hill Recreations are not eligible. No purchase necessary to enter.